Ping''s ''Mid Bounce'' wedge provides versatility and forgiveness from all lies and for all abilities. The Custom Tuning Port (CTP) dampens vibration and permits swingweight customization. The variable-width sole combines with a classic look at address for the confidence to open the clubface for delicate approach shots. The leading edge stays low when opening the clubface to add loft, and to also play full shots, chip shots, high shots, or low shots. I HIT MY PITCHING WEDGE APPROX. 115 YARDS AND MY SAND WEDGE 90 YARDS. WHAT DO I USE FOR 100 YARDS AND WHAT ARE THE DEGREES OF EACH WEDGE. ? The only loft option we have in this wedge is a 54 degree SW. It sounds like you need a gap wedge to fit in between your PW and SW. As for what loft will be best, you will need to know your lofts of your 2 clubs. You would want to fit a gap wedge in between those clubs about 4-5 degrees apart. Example: If your PW is 45/46 degrees and your SW is 55/56, then a good option would be 50 degree GW. 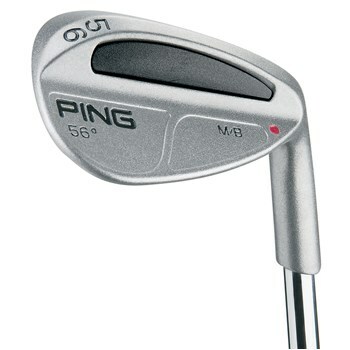 i am looking for the wedge featured in the photo ping MB 56 DEGREE red dot - used. do you have it in stock ?